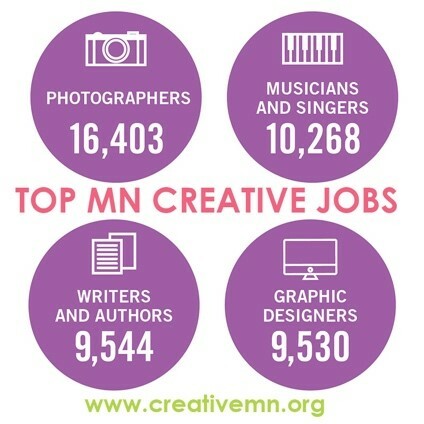 Creative Minnesota studied national data on the impact of 41 creative occupations on Minnesota’s economy. These creative occupations included many specific to music, including music directors and composers, musicians and singers, audio equipment technicians, sound engineering technicians, and others. The study did not differentiate between for-profit or not-for-profit workplaces. There are 10,268 musicians and singers in Minnesota, the second largest creative worker profession in the state. Performing arts is by far the most common type of nonprofit arts and culture organization in Minnesota. Of the 1601 participating nonprofits, 695 were performing arts, which includes theaters, music and dance organizations. Minnesota Orchestra, MacPhail Center for Music, St. Paul Chamber Orchestra, MN Opera, The Schubert Club, VocalEssence, American Composers Forum, Cantus, Greater Twin Cities Youth Symphonies, Irish Fair of MN, MN Chorale, MN Sinfonia, Twin Cities Gay Men’s Chorus, MN Youth Symphonies, St. Paul Conservatory of Music, Minnesota Boychoir, Walker West Music Academy, Hot Summer Jazz Festival, MN Brass Inc., One Voice Mixed Chorus, Skylark Opera, MN Conservatory for the Arts, Nautilus Music Theater, Great Northern Union Chorus, Center for Irish Music, Copper Street Brass, Lyra Baroque Orchestra, Twin Cities Women’s Choir, Sounds of Hope, Edvard Grieg Society, Minnesota Music Coalition, Twin Cities Community Gospel Choir Twin Forks Chorus, Red River Children’s Chorus, North Country Fiddle and Dance, Headwaters School of Music & the Arts, Vocalmotive, Northern Light Opera Company, Bemidji Chorale, Park Rapids Area Community Band, Duluth Superior Symphony Association, Armory Arts and Music Center, Northern Lights Music Festival, Itasca Orchestra and Strings Program, Bemidji Symphony Orchestra, Duluth Festival Opera, North Shore Music Association, Sacred Heart Music Center, Three Bridges International Chamber Music Festival, Lake Superior Chamber Orchestra, Lake Superior Youth Chorus, Arrowhead Chorale, Mesabi Symphony Orchestra, Crescendo Youth Orchestra, Heartland Concert Association, Echoes of Peace Choir, Embarrass Music Festival, Singing Slovenes, Twin Ports Wind Ensemble, Grand Rapids Area Male Chorus, Itasca Chorale Society, Great River String Ensemble, Rainy Lake Community Orchestra, MN State Old Time Fiddle Contest, Borealis Chorale, Fargo-Moorhead Chorale Artists, Lakes Chamber Music Society, Central Lakes Symphony Orchestra, Vikingland Band Festival, Preservation Concerts, St. Francis Music Center, Heartland Symphony Orchestra, Lakes Area Music Festival, Staples Area Men’s Chorus, Lakes Bluegrass Festival, RiverSong Music Festival, Crow River Drumline Association, Crow River Area Youth Orchestra, East Central Minnesota Chorale, Land of Lakes Choirboys of MN, St. John’s Boys Choir, St. Cloud Symphony Orchestra, Chamber Music Society of St. Cloud, St. Cloud Municipal Band, Youth Chorale or Central MN, MN Center Chorale, Buffalo Community Orchestra, Great River Chorale, St. Cloud Area All Star Jazz Band, Mankato Symphony Orchestra, New Ulm Suzuki School of Music, Mankato Children’s Chorus, Rock Bend Folk Festival, Minnesota Valley Sweet Adelines, Minnesota Over 60 Band, Rochester Symphony Orchestra and Chorale, Honors Choirs of Southeast MN, and many, many others. Part of this year’s Creative Minnesota report was a statewide survey of Minnesota’s artists and creative workers. The different generations report practicing different art forms, with 46 percent of those born before 1946 most commonly doing the visual arts and Millennials most often (25 percent) practicing theater. The popularity of music as an art form has been slowly growing with each successive generation. Seventeen percent of Millennials put themselves in the music/opera/ musical theater category, compared to only 9 percent of Elders. 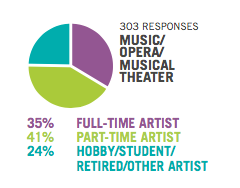 Interest ingly, people in the music/opera/ musical theater category were most likely to report that they worked full-time as artists (35 percent) compared to most other artistic disciplines. However, the remaining 41 percent of people in this category reported being part-time, and 24 percent said they were hobbyists, students, or retired. In contrast, only 23 percent of visual artists were full-time, and only 22 percent of photographers were working full-time in their field. Musicians reported the highest income from their art, and the highest income overall, than other artists in Minnesota. Musicians reported that they make on average $18,225 from their art, with $29,792 in earnings from other jobs, for a total average income of $48,017. Download the full report to see how musician or singers compare to other artists at www.creativeMN.org.